But I did manage some stitching, though not as much as I would hope. During IHSW I did manage to finish a page from Afternoon Tea but you have already seen that. 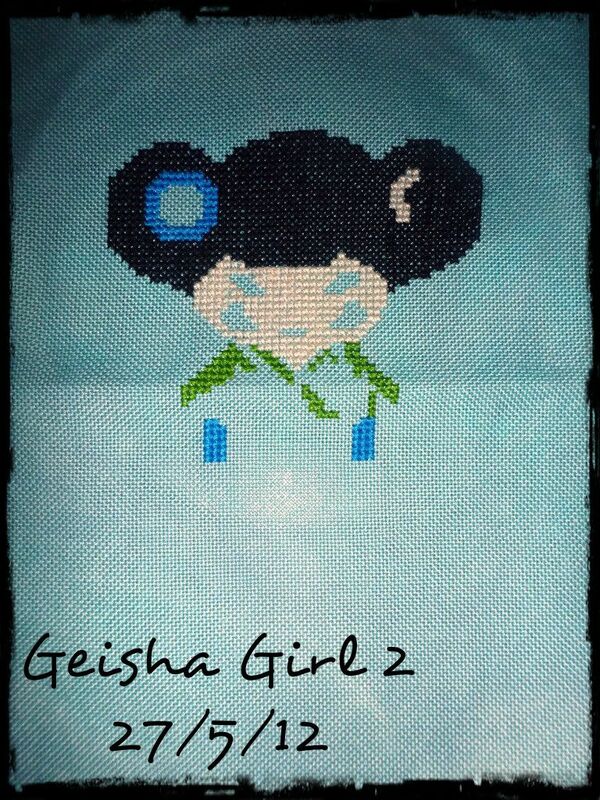 I have been working a tiny bit on Geisha Girl I really want to get this one done. I'm going to see what I can do tonight during downtown! 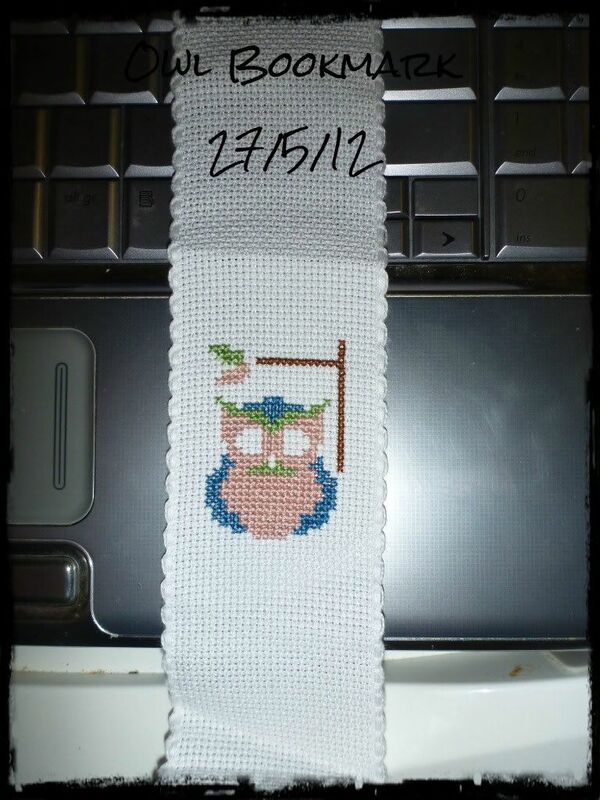 Oh and I made a mistake and made a new start (mistake because I don't have time for my current projects) It's a little owl bookmark. We shall see how it turns out. and happy dance it joins up! I was a little worried that it wouldn't but I shouldn't have been. 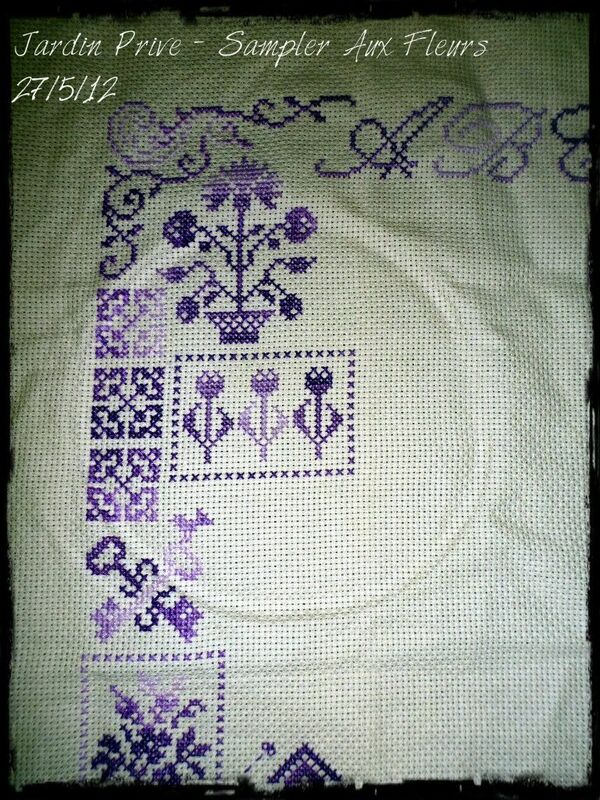 Here is a close up of the corner motifs I love the colour so much! I think I am really really really bad about collecting my ORTs because this never seems to grow. LOL, Cait, I have that problem too. It's mostly because my orts are soooooooo small. It's rare that I have more than a quarter of an inch left. Hope you got the new house ALL sorted and can move whenever you want. I'm happy you're in the ownership mode. That's awesome!! Your Geisha looks great, and I too love the color of your Jardin Prive. It's gorgeous, and you got a LOT done on it. Grats on all the progress!! With so much work in the house, it's a miracle you find time to stitch:-) your stitching is beautiful and jardin,prive is gorgeous! I like the corner motifs too, and think the color is very delicate and beautiful! Don't worry about the ORT. 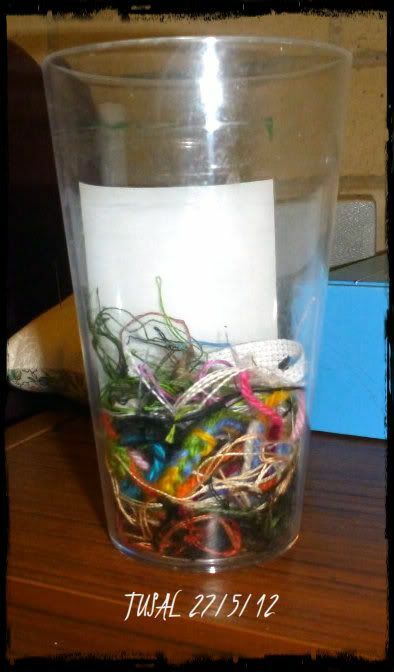 The only thing that gave.me a fuller jar, was was all the frogging I had to do! All your stitching is looking great Caitlin. Congrats on the sides meeting up. Wow, all of your projects are so pretty! It looks like Geisha Girl will be really cute. 'Geisha Girl' is coming along nicely, and I absolutely love your beautiful progress on 'Jardin Prive- Smpler Aux Fleurs'. 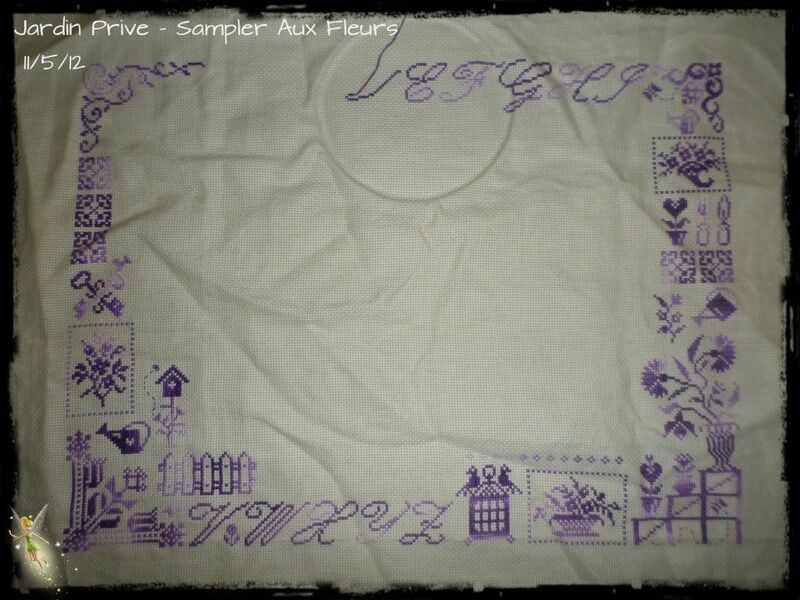 The motifs are all so lovely! I always worry with projects like that to. They both look great. Whew! I always worry about things joining up also. Your stitching looks great. Love the Jardin Prive piece - both the design and the colour. Wishing you all the best for life in your new home. 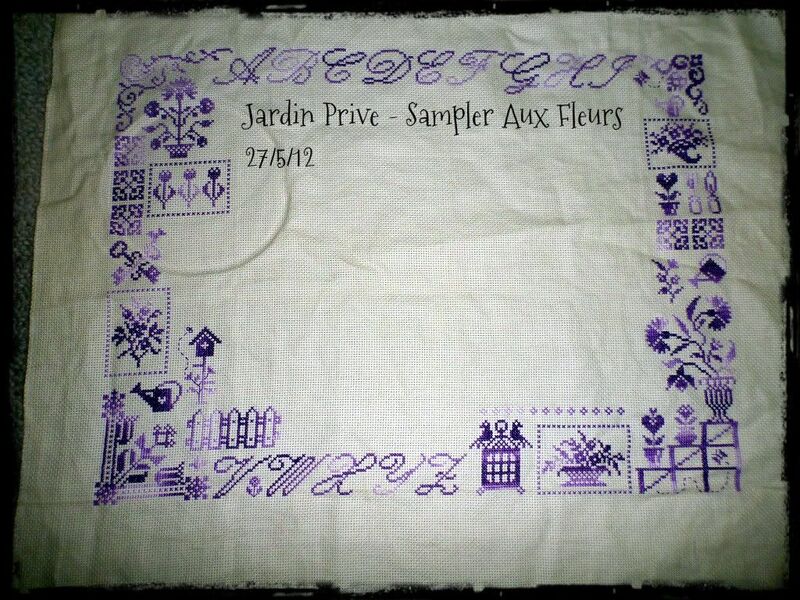 Your Jardin Prive is beautiful! So happy it all joined up for you. The little Geisha and bookmark are very cute too! Jardin Prive is looking lovely.